The "buttered toast" sunburst on this OMG is just jaw dropping in person! Payments as low as $153/mo. Or, apply & pay as little as $153/mo. A new sun has risen over SoundPure! Seriously, this thing lights up the room both visually and sonically. The OM Grand is special to begin with--the balance and natural compression of an OM with the raw power and presence of a dread. We knew that SCGC's new ordering structure allows us to select a whole bevy of features, cosmetic and structural, at no additional cost. So we went wild! Buttered toast top, cowboy rope border/rosette, big ol' Schaller Imperials--yes, yes, yes! Naturally, we needed the right tonewoods to make this statement complete. We're already in 0000 territory, why not tip the hat to the 28s? Addy/EIR brings out the best of this design--endless headroom and clarity, rolling waves of natural reverb and harmonics, dread-like bass that complements but never overshadows the rest of the range. Beauty and the beast, all in one package! SCGC’s OM Grand is a bigger, lusher, louder sister to their extremely popular OM model. In comparison, the OM Grand embodies the same elegance, only in increased quantity of volume, projection and bass. More isn’t necessarily better, though in the context of a band’s competing acoustic instruments the ‘more’ of the OM Grand assures the guitar’s rightful dominance in the ensemble. 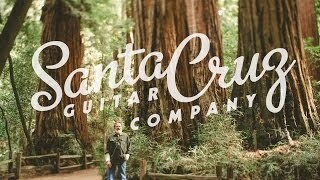 At the 2012 NAMM Show in Anaheim, SCGC’s longtime friend and dealer, Harry Tuft, asked Richard about building a special guitar to commemorate the 50th Anniversary of his shop, The Denver Folklore Center. In honor of this prestigious accomplishment, and the historical impact Harry’s shop has had on the folk movement in this country, Richard was thrilled to accept. Harry wanted a custom OM guitar with a larger body size for an increase in power in a body shape reminiscent of C.F. Martin’s historic 0000. Harry further customized his guitar to his playability needs and aesthetic values, including inlays commemorating his milestone 50th anniversary. In preparing the templates for this new body size, Richard saw this enhanced sized OM as a fine addition to the stellar line-up of SCGC standard models, and the concept of the OM Grand was born.The strength of the OM Grand isn’t limited to sheer volume. In the sometimes restrained presence of solo fingerstyle playing, the inherent power of this guitar will generate a forceful bloom, requiring less effort with no loss of nuance.The best available tone woods are selected, voiced and tuned, as they are on all SCGC models. These include Indian Rosewood, responsibly harvested from the highest quality timbers, Sitka Spruce from British Colombia and premium Mahogany from sustainable resources. Neck Width at 14th Fret: 2 3/16"